Leave your troubles behind as you step on board the Scenic River Cruise and embark on an adventure of a lifetime. We make it easy for you to put your problems out of your mind for a moment as we bring you places you could only dream about. There’s no detail we haven’t anticipated when it comes to your accommodations, food and experience. As we always tell our guests, we are not just a floating five-star hotel, we are selling an experience. Each destination is carefully chosen where you can fully immerse yourself in the local culture, traditions, sights and cuisine. We guarantee that when we leave for another destination, you are going to be richer because of the knowledge and customs you experience that is entirely different to yours. While some tourists like to take the plane to get to their destinations quickly, there’s something to be said for the slow journey where you really get to soak in the sights and all your senses are fully stimulated. Unlike ocean cruises where sometimes there’s a lull in the view when there’s nothing but the open sea, with river cruises, there’s always a breathtaking spectacle as we sail down the waterways. So make sure your cameras or mobile devices are fully charged because it’s guaranteed that you are going to catch a glimpse of stunning beauty from outside the deck. Each of the itineraries in our river cruise packages are carefully selected in order to maximize the experience of each of our guests. From the moment you stepped on board our Scenic ship, you will immediately realize that this is going to be a cruise like no other. You will be escorted to your luxurious accommodations, from the slumber bed, comfortable sheets and info-tainment system. When we dock, you will have a choice of a guided tour where you will follow our very knowledgeable tourist guide. If you don’t like a group tour, you can go off with your family and friends on your own and follow the recommended activities that we personally handpicked to make sure you don’t miss anything. One of the many advantages of going on a river cruise is the amount your save in terms of hotel or food expenses. With our Scenic River Cruise, everything is all-inclusive. There’s nothing like sipping a bottle of beer as you soak in the sights in one of our tours. You can wake up early to watch the sun rise or just linger on our deck as the setting sun paints the sky orange. Partake of our delicious food prepared by award-winning chefs. You can choose from our scrumptious spread that represents authentic and exotic cuisines. From gourmands to gourmets, you will walk away fully satisfied. But we also serve comfort foods and the more traditional menus for the conservative guests. Before you even board, you will answer our checklist of the prohibited foods or allergens that you need to avoid. We make sure that by the time you board, our food and beverages manager is already briefed about all your requests. There’s nothing more tragic on our end than a bored guest. If that happens, we feel that we fail on our job to make sure each of our guests get five-star treatment. This is why inside our Scenic River Cruise, we pack the day with activities so passengers get an option if they feel like staying on the ship rather than touring around in one of our destinations. The Mekong River spans more than 4,300 kilometers long that starts in Tibet, cuts a swathe through the Himalayas and into the Yunnan province in China and before ejecting into the South China Sea, the mighty delta straddles Vietnam, Cambodia, Laos, Myanmar and Thailand. In Hanoi, you get to walk around the Old Quarter (which amazingly is already 1,000 years old) and get bargain prices on food, goods and souvenir items. Gaze at the architecture with a lot of French influence. Next stop is the Ha Long Bay, a UNESCO Heritage Site located in Quang Ninh Province. With its 2,000 islets, clear waters and powdery sand beaches, there’s so much of the place to explore. There are caves and chambers that have been converted into a grotto. There are countless resorts that offer authentic cuisine at very cheap prices. You will also experience the biggest floating market in the Mekong river in Cai Rang. It’s open from as early as 6 a.m. until 7 p.m. You can buy fresh catch and produce and the vendors will cook the food right on their boat as you wait. 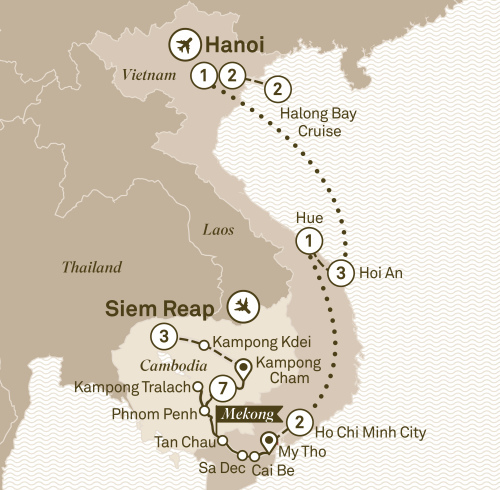 A visit to Vietnam won’t be complete without stepping into the historic town of Hoi Ann. This is a walking tour so prepare your camera and your comfortable shoes as you walk around the city. Hoi Ann is also a UNESCO Heritage Site. Be transported to the time when the area was a bustling trading port during the 15th-19th centuries. We can visit the famed Angkor Archaeological Park and see the opulence and magnificence of the Khmer Empire from the 9th to the 13th centuries. Cambodia is already synonymous with the Angkor Wat (or City of Temples), a complex of temples spanning more than 160 hectares. Ancient Khmers believed that the gods lived there. While in Phnom Penh, you get a history lesson as well. This is purely voluntary, of course, but we do encourage that you visit Cambodia’s killing fields back when dictator Pol Pot and his Khmer Rouge laid waste to the land. You will visit the school that was converted into a prison dubbed “S21.” Today, it’s a museum that carries exhibits and images that may be too much for some. There’s a lot of culture in this trip as well. We make sure to stop by a local village where our guests can interact with the residents. Traditional silk-making from the silkworm and pottery making still exist today, and you may even try your hand at making one of these. As we slog toward the Upper Mekong, we pass by Laos, Thailand, and finally the Irrawaddy and Chindwin rivers of Myanmar. Marvel at the Bagan temples, which numbered more than 10,000 at the zenith of the Bagan Empire from the 11th to 13th centuries. Prior to the August 2016 earthquake, there were still more than 2,200 temples standing. The devastating disaster flattened or damaged 400 of these pagodas and temples but the government is working to restore a good number of them. The Laos-Thailand and Myanmar River Cruise will take you to thick jungles and sleepy coastal villages. We get to visit Pak Lai, located in Sainyabuli Province to the west of the capital, Ventiane. You can look at the colonial architecture that harkens back to the time when the French ruled Laos. You can also visit Buddhist temples and see the old monks’ quarters. In Vientiane, you will walk around the Buddha Park and marvel at the 500-year old statues and images. After which, you can practice your haggling skills at the Dong Mak Khai Market where you can shop till you drop. They may not speak English, but they have a handy calculator where you enter your digits. You can also watch a traditional Lao dance at the market. A visit to Laos won’t be complete without going to Luang Prabang, which is classified as a heritage site by UNESCO. There are countless temples in the area, including the former Royal Palace, the Wat Visounnarath. There are also waterfalls, caves, historic villages and the local cuisine to experience. Thailand is the best example of inter-marrying the traditional and modern. In the north, you have the colder region of Chiang Mai, and the south you have the world-class beaches of Phuket. A Scenic River Cruise with us is an experience like no other. You get to know all these countries and their exotic cultures, and enrich yourself in the process. The knowledge and experience you gain from any of our cruises are priceless, and when you consider our very attractive packages, then the only thing to do is to book your next trip!